My little Ladybug is just four years old and she struggles (as I imagine most kids her age do) with what is reality. We are working on learning the difference between cartoons and people; people and puppets. It’s a lot for a little kid to digest. 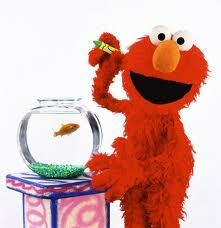 Elmo looks real, and all those people who are real talk to Elmo like he’s real. Elmo is a monster, but wait, mommy said monsters aren’t real. Does that mean mommy was wrong? We had to go find a puppet and put on a whole puppet show to prove that it was indeed possible for Elmo to not be a real monster but instead a puppet and still have real people interact with him. Cartoons are of course easier to explain. Mickey Mouse is not a real mouse. Let’s go see what real mice look like. This process has been exhausting. Then, she happens to see a commercial for the latest Transformers movie coming to DVD. (I won’t mention who I have to thank for her witnessing that one!) I fumbled my way around trying to explain how it was a combination of people acting and computer animation. Can you guess how much of that went over her head? I feel like this is such an important thing for her to learn and I do not want to fail her now. I hope that her ability to distinguish between reality and imaginary will help her cope with nightmares, and learn to discern fact from fiction when she hears it. Okay, maybe I’m putting too much weight on this, but it feels important. For now I’m just trying to be as honest as I possibly can without offering too much information that might confuse her. You know, like how computer animation actually works.